I’m BACK with more Halloween cut files. I’ve got two cute ghosts with bows. 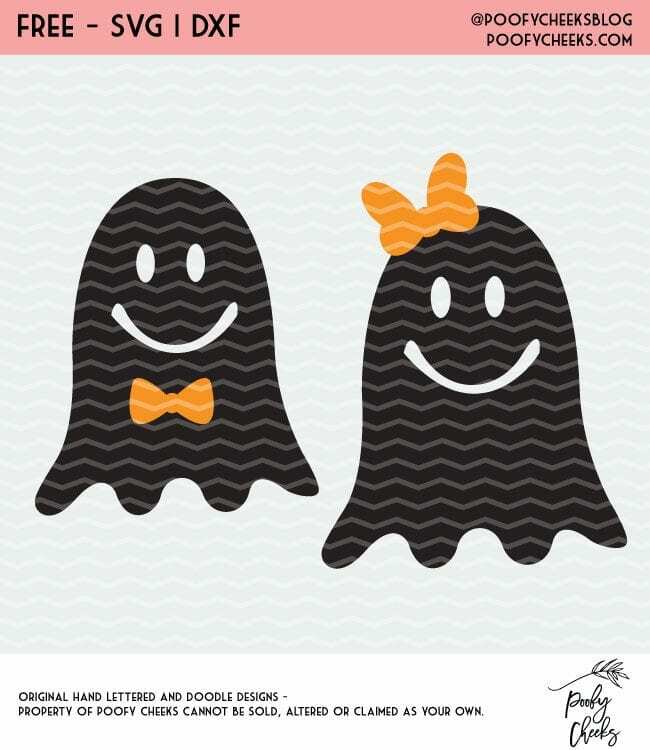 A girl ghost and a boy ghost perfect for family shirts or baby onesies. Let’s make this short, sweet and to the point because on this fine Friday all I can think about is eating tacos. Cut these files onto any medium you prefer and make SO MANY THINGS! Make mugs, cups, shirts, onesies, tote bags or basically whatever your heart desires. I have put together a list of adhesive and iron-on blanks to give you more ideas. My Vinyl Direct has a whole bunch of blanks you will fall in love with. I buy from a handful of different places to get my hands on new products when they come out. My favorite is Happy Crafters because the girls are always so willing to help and they have quick processing time. I hate waiting around for items to ship ya’ know!? My next favorite is Expression Vinyl. Both of these places offer the typical colors and types of vinyls and both have an array of fun prints staying on top of new trends. Yes. The form is used to track cut file popularity and how many times cut files are downloaded. Yes, the cut file is for personal and commercial use. You may NOT sell the digital files themselves but you may sell items you create using the cut file designs. Please tag us with your creations on IG (@poofycheeksblog) and we may share on our own feed! Sign up and get instant access to the Ghosts with Bows cut file. Join over 8,500 others who get access to our free cut file library.